Bonnie Poplar's Capturing Series follows on from her obsession with the old hunting tradition - as seen in her Hunting Series. The silhouettes of three animals have been 'captured' within decorative frame shapes reminiscent of the frame mounts used for hunting trophies. This brooch features a galloping horse with flowing mane and tail. We're so excited to be stocking Evi's super-sweet designs, and have no doubt they'll be snapped up quickly! 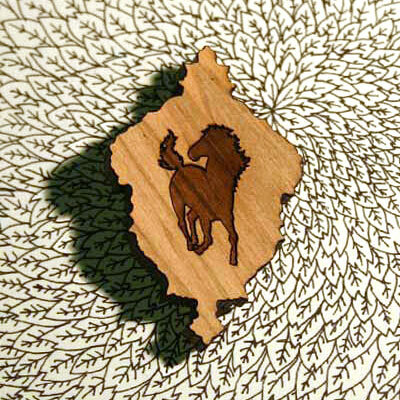 Bonnie Poplar brooches are made using double-sided veneer timber called Rimu which originates from New Zealand. Each brooch has a silver tone brooch back pin with hook lock on the back. The quality & detail of the laser cutting & engraving is exceptional! Evi O. is a book designer and illustrator from Sydney, and Bonnie Poplar indulges her passion and imaginations, translating her 2D delicates onto 3D wearable objects. Quirky narratives are embodied within each hand-made novelty, giving her products a curious feel.